This article has been updated since published to include Adrian Arnieri winning second place in the competition. 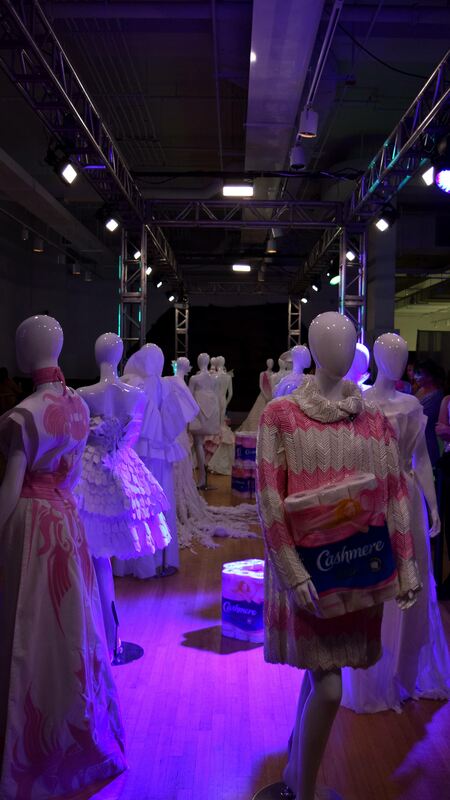 With the music turned up and stage lights on, a couple of Ryerson University fashion students showed off their talents to Toronto last night, through the use of bathroom tissue. 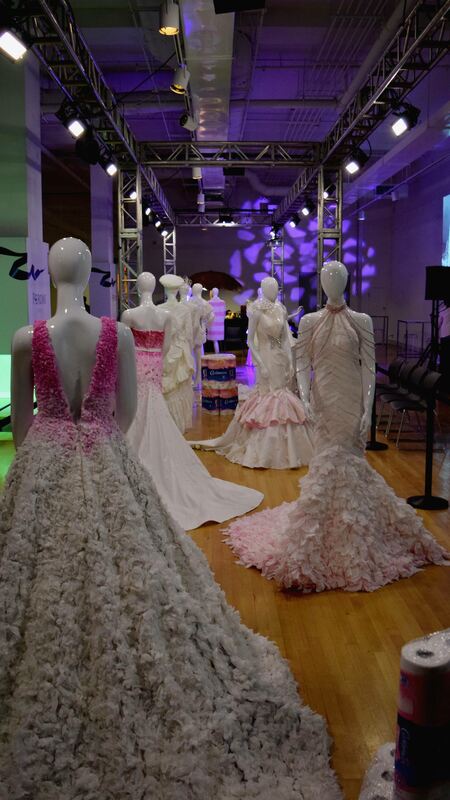 This weekend marks the 14th annual White Cashmere Collection and the focus was Canada’s fashion designers of tomorrow. 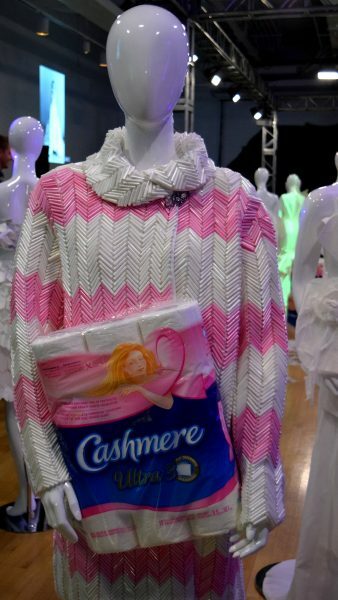 Over 150 students from 11 different schools entered the Cashmere contest, but only 16 students made it to the runway. Representing Ryerson were Adrian Arnieri and Van Yanez. 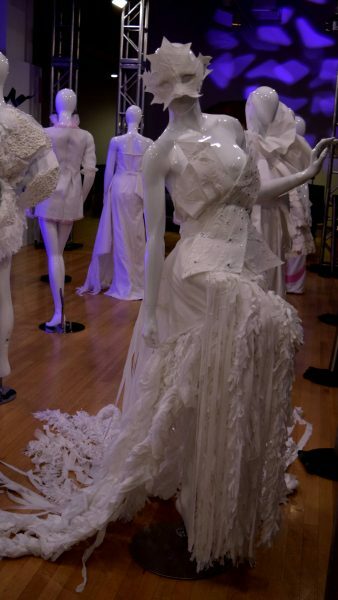 From head to toe, the contest participants had to design outfits made completely out of bathroom tissue. The exhibition was held at the Royal Ontario Museum (ROM) and was the kickstarter to the Friday Night Live program at the ROM and also kicked off October’s Breast Cancer Awareness Month. 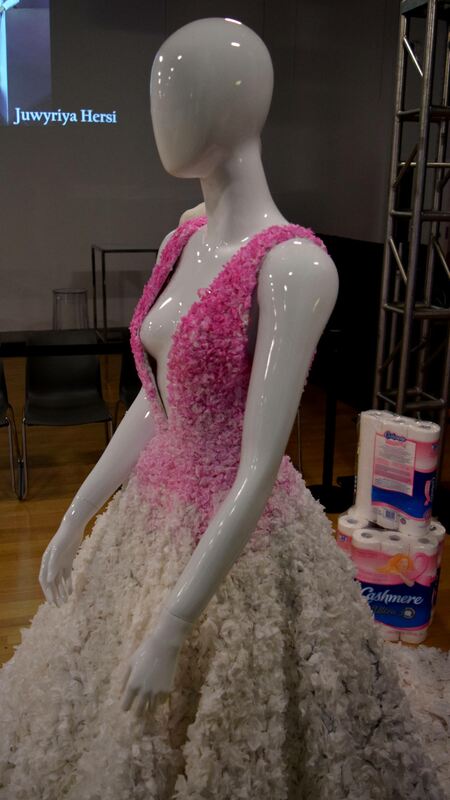 Every year, the bathroom tissue brand holds this event to raise more awareness to breast cancer. They sell pink ribbon packages for the month of October with 25 cents from each package sold going to breast cancer research. The collection for this year honours Canada’s 150th year since Confederation and the designers brought that out in their work. Adrian Arnieri looked at the reality of what all Canadians have to go through every year. His jacket design represents his take on the harsh winter Canadians face. Arnieri took second place for his designs and received $2,000. Van Yanez, a recent Ryerson graduate, was inspired by Canada’s relationship with the Netherlands back in World War II. His gown features tulips—the flower that the Netherlands gifted Canada after taking refuge of the European princess, Juliana. 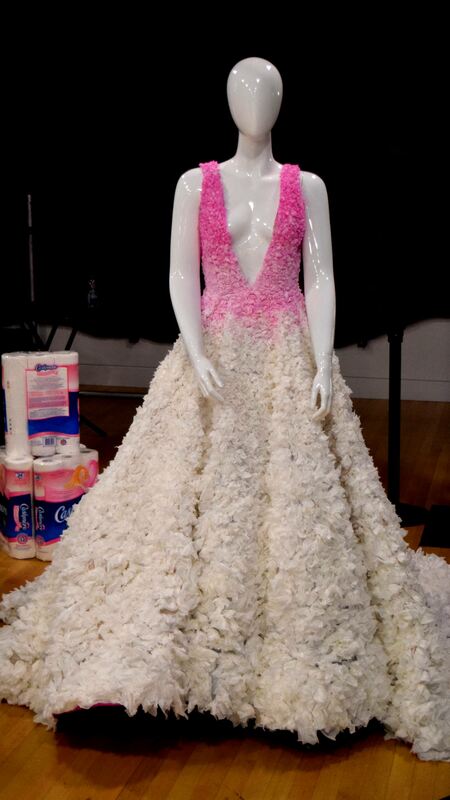 Creating a gown completely made from bathroom tissue is as difficult as it sounds. 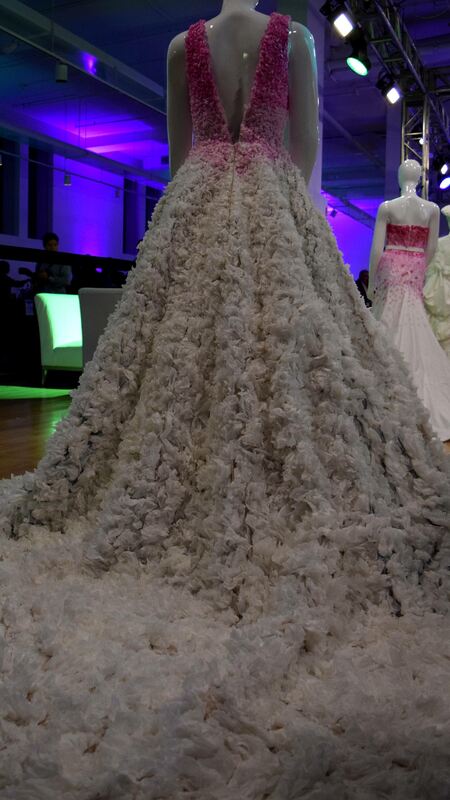 Yanez made between 3,000 and 5,000 tulips for his gown. The process took about 3 months, working on the gown only on weekends. “It was quite difficult because I was working full-time as well. So I was killing myself [with work],” he said. Each designer is given the same amount of bathroom tissue measuring at about 100 metres. Yanez said that it may not look like the regular tissue you buy in the store because it’s not. The tissue given to the designers isn’t cut like the packages people would find in stores. The 100 metres come in a long roll resembling a big piece of fabric rather than a bigger version of what you can find in your bathroom. It’s up to the designers on how they’ll incorporate the colour pink (for breast cancer awareness), some standing out more than others. 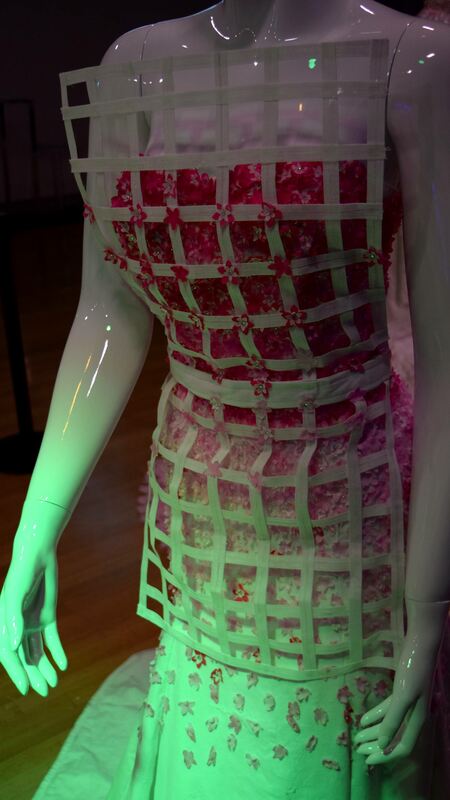 Yanez used the pink as an ombre on the dress, a task not as simple as it may seem. 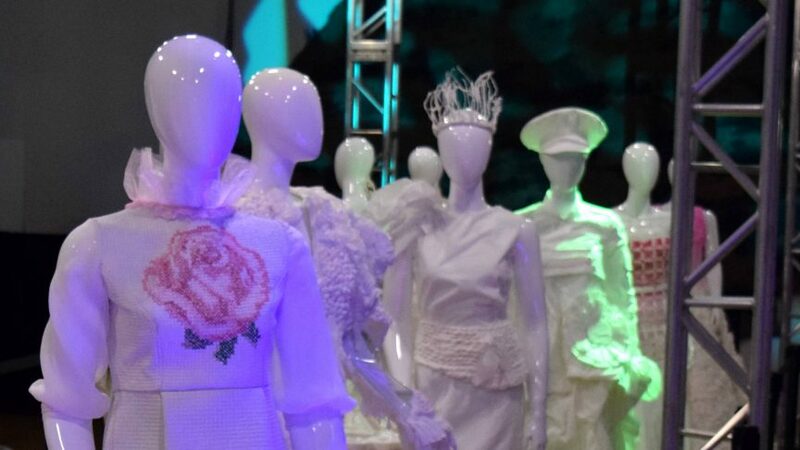 Creating designer pieces doesn’t go without trial and error, something Yanez says fashion students will have to face. But that doesn’t mean you can’t have fun. “A sense of humour is very important,” Yanez said. It’s not about taking things too seriously, but trying something different when everything fails. “It is a very intense and demanding program and it’s not easy. But it’s wonderful,” he said. Winning a contest like this also opens doors to valuable opportunities for students. The top three finalists receive money that will help them advance their fashion careers. Yanez had the opportunity to speak with people from the industry who are offering their hands in helping him reach his career goals. He plans to start his spring and summer collection to put in the Toronto Women’s Fashion Week. This Cashmere contest was a big step into the working world and Yanez couldn’t be happier. “I’m closing my journey through Ryerson with a big bang,” he said.